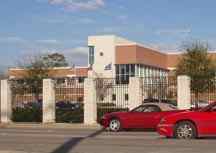 Harris County Homeland Security and Office of Emergency Management, is located in the Transtar building near the intersection of I-10 and the west loop of 610 . Their role is to mitigate, prepare for, respond to and recover from the effects of disasters, be they natural disasters such as hurricanes or floods, to other hazards such as refinery fire. They have a large EOC in the Transtar building and has an Amateur Radio room just down the hall in the communicatons center. City of Houston Office of Emergency Management The City has its EOC in the recently built Houston Emergency Center just north of the city center. The Center integrates all the City 911 activities and emergency management. 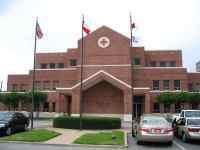 Greater Houston Area Chapter of the American Red Cross, The Greater Houston Area Chapter of the American Red Cross is located at 2700 Southwest Freeway just west of Kirby Drive. The American Red Cross is the only congressionally mandated organization to provide aid to victims of disaster and is responsible for fulfilling the mandates of the Geneva Convention within the United States of America. The Houston Chapter has its own communications room run by a small group of volunteer ham radio operators. It is located behind the main Red Cross building complex in Room 302 of the John McDivitt Disaster Command Center. The purpose of having this capability is to provide radio communications between the Red Cross Disaster Command Center in Houston and American Red Cross National Headquarters in Washington, DC, federal, state and local government agencies and all Red Cross shelters within the disaster area. The phone numbers for the EJ Hadash Jr. Communications Room are 713-313-5319, 5320, and 5321. National Weather Service program. In addition to traditional goverment agencies many of our members also participate in the NWS Skywarn program. These volunteers provide valuable information to the NWS to improve the warning program which could save lives and prevent property damage in your community.